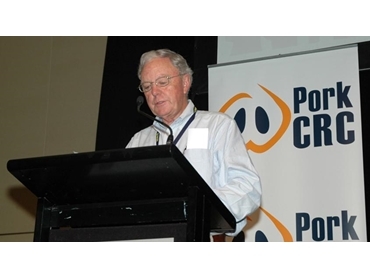 Pork CRC Chairman, Dr John Keniry, believes the CRC’s work is vital to maintaining Australia’s strong domestic pork industry and its international competitiveness. At a time of great challenge for the Australian pork industry, research by the Pork CRC in the last year has reduced feed costs and improved herd production efficiency and is working to improve pork’s consumer appeal. Speaking at the release of the Pork CRC’s 2007/08 Annual Report, Pork CRC Chairman, Dr John Keniry, said the Centre’s work was vital to maintaining Australia’s strong domestic pork industry and its international competitiveness. Among the report’s major highlights were the development of two barley varieties, two triticale varieties and a field pea, Maki, all of which will be released in 2009. “The Pork CRC triticale project, with the University of Sydney, has identified and developed two varieties, one of which is about to be released, with 8-16 per cent higher yields than current benchmark varieties. This is a major breakthrough,” Dr Keniry said. The Pork CRC’s development of Near Infrared Spectrometry (NIRS) calibrations for rapidly determining the Digestible Energy (DE) and other nutrient contents of grains will revolutionise the accuracy and cost effectiveness of pig diet formulation. “This will not only benefit the pork industry by allowing grains to be more accurately valued, but it also applies to other animal industries,” Dr Keniry said. Research on feed efficiency will reduce the cost of production for pork producers and increase income. “Pork CRC research discovered that increasing the dietary DE content for lactating gilts increased the number of sows having a second litter by 30 per cent, a finding which will significantly increase revenue for the Australian pork industry,” Dr Keniry said. Research has also demonstrated the benefits of strategically using the additives Paylean and Porcine Somatotropin in pig feed. This has been shown to deliver potential increases in profit from $5.10 to $7.50 per pig and deliver big gains in feed use efficiency, a vital benefit given the current high cost of feed. Increasing the level of fat in the diet of finisher pigs has been shown to improve carcase weight and feed efficiency. “This important finding has clearly demonstrated that current pig nutritional standards need to be questioned if Australia is to reduce the cost of production that’s required for sustainable and profitable pork production,” Dr Keniry said. The Pork CRC will continue to trial the benefits of combining fat and fibre in pig diets, as well as investigating the adequacy of amino acids in the diets of grower pigs. Working with the Australian Pork Farms Group (APFG) and the Victorian Department of Primary Industries (VDPI), the Pork CRC has developed a vaccine and vaccination procedure for the disease Actinobaccillus pleuropneumoniae (APP). This highly effective vaccine is faster, easier to deliver and cheaper than current vaccines. In the area of diet and human health, the Pork CRC’s innovative research work is examining nutritional strategies to increase pork’s selenium and iron content for better health. It’s also investigating how pork’s high thiamine content might help manage and control Type 2 diabetes. “The Pork CRC’s important work to reduce costs, increase production and research pork’s advantages for human health will continue to benefit Australia’s pork industry and economy into the New Year and beyond,” Dr Keniry concluded.